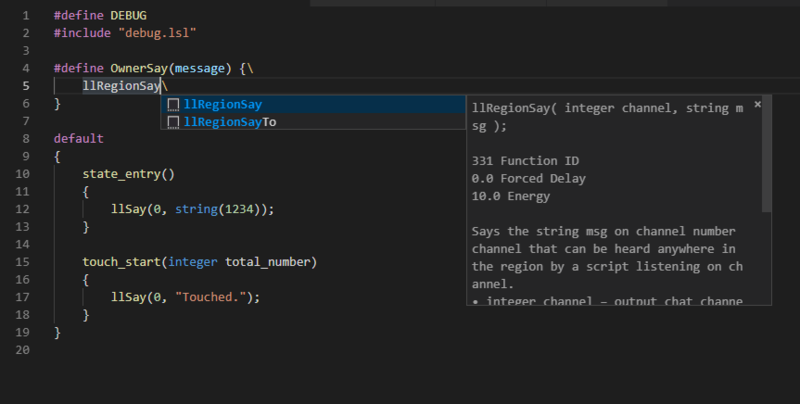 Visual Studio Code>Programming Languages>LSL-FPNew to Visual Studio Code? Get it now. Code Snippets for LSL All Constants Description. Added syntax Highlighting for LSL Flow Control. Added syntax Highlighting for LSL Types. Added syntax Highlighting for Firestorm LSL Preprocesser. Added Code Snippets for LSL Flow Control. Added Code Snippets for switch of Firestorm LSL Preprocesser. Added Code Snippets for LSL All Function. Added Code Snippets for LSL All Constants except Description.